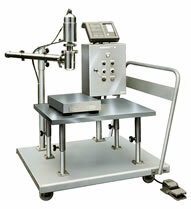 The Quantitative Charger features a weight-setting system using a load cell. Settable weight ranges from 1 to 30 kilpgrams, with measuremnt errors less than ±2% thanks to the adjustment function provided. Each component consists of sanitary parts, which are easily disassembled for cleaning.